The prototype, which became known as the Seagull Mk I, was modified from an existing Supermarine Seal II in 1921. Only one aircraft was made. A Napier Lion II engine was fitted and there were modifications made to the nacelle. Produced from 1922, the production aircraft, the Seagull Mk II, had a Napier Lion III engine, and these were supplied to the Air Ministry and Royal Navy. A total of 25 were built, although some of these were later modified. The Seagull Mk III was the Australian version, built in 1925. These were similar to the Seagull II but with a Napier Lion V engine and radiators modified for tropical use. Six of these were supplied to the Royal Australian Air Force, and one other Seagull III was built for Japan. One Seagull II was rebuilt and fitted with Handley-Page leading edge slots and twin fin and rudders in 1928. This was considered to be the Mark IV, although Supermarine never designated it as such. 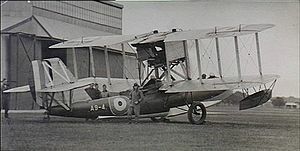 Three ex-service aircraft were later placed on the British Civil Register. One additional aircraft was built in 1933, using a Bristol Jupiter IX engine in the pusher configuration. This became known as the Seagull V and was the forerunner of the Supermarine Walrus. The type was used operationally as a fleet spotter. The Seagull II was the first British aircraft to be catapult launched in 1925. The crew was normally three (Pilot, Observer, and Radio-Operator). The sole armament was a .303 in (7.7 mm) Lewis gun. Royal Australian Air Force received 9 aircraft. Imperial Japanese Navy Air Service received 1 aircraft. Fleet Air Arm received 26 aircraft. The Fleet Air Arm Museum owns the front hull of an unknown Seagull. It was in use until 1974 as a garden shed, and presented to the museum in exchange for a new shed. It is currently on long-term loan to Solent Sky, an air museum in Southampton. Andrews, C.F. and Morgan, E.B. Supermarine Aircraft Since 1914. London: Putnam Books Ltd., 2nd revised edition 2003. ISBN 0-851-77800-3.